Natural use of language is orderly - a fact that gets camouflaged by what has often been described a 'the messiness of language in use' but which, in fact, often arises from the permeability of social contexts: life's business is not compartmentalised. The chapters of this volume explore the two axes known as texture and structure along which the orderliness of language in use makes itself felt. These properties bear a close relation to the context of situation in which a discourse comes to life. The complex relationship of the structure potential of a variety to its underlying context is discussed and exemplified in the description of particular types of economic transactions, of stories for children, and of advertisements. 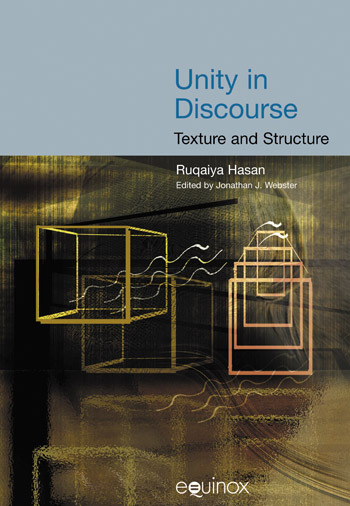 The relationship of texture to the structure of the text is discussed: texture is a condition for the creation and realisation of textual structures. In this way, texts can be seen as the record of their own cultural context represented semiotically.